We would like to take this opportunity to wish all our readers a Happy and Prosperous New Year. it is five to ten minutes’ walk from Finchley Central Station (Northern Line). Tea/coffee and biscuits follow the talk. 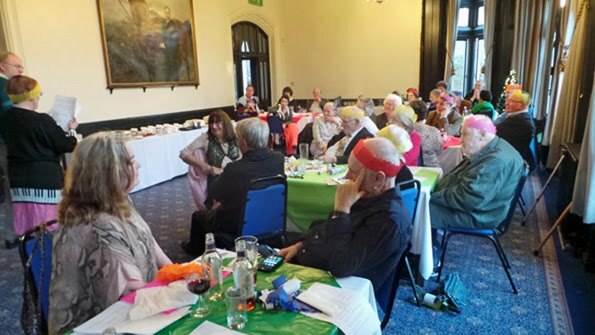 34 people assembled at Avenue House on Sunday 11th December for our annual Christmas event and a good time was had by all. This time not a buffet, but a sit-down meal preceded by canapes prepared and served by Malcolm and his staff. The tables were adorned with coloured table cloths and crackers and party poppers. Table quizzes to check our knowledge were devised by Vicki Baldwin encouraging much cerebral exercise. Musical entertainment was performed by Jo and Jim Nelhams and Andrew and Liz Tucker, and visual entertainment from Don Cooper sporting this year’s Christmas jumper and hat. There was also a successful raffle – see photo for the great prizes. No Ted, of course, as he is the HADAS mascot. The food was concluded with tea / coffee and mince pies, and two splendid cakes, one fruit and one sponge both cooked by Liz Gapp. Lovely to see two newer members, Annette Bruce and Joanna Fryer attending this event for the first time. Huge thanks to everybody who helped with the organisation. London and Middlesex Archaeological Society, Walking through London’s History. 51st Local History conference – at Museum of London 19.11.2016 – short report. The first presentation was from Prof. Caroline Barron and Prof. Vanessa Harding on Mapping Medieval and Early Modern London. They are working on a project to update the Historic Towns Trust’s map of London, c.1520 and they described the sources available to them. The HTT’s map appears in Mary Lobel’s 1989 book The City of London from Historic Times to c.1520 which needs correction and updating. They will use digital enhancement techniques and will include information from archaeological sources. NB It is not yet available so watch for an announcement in the near future. Below are abstracts from two more presentations – a fuller report appears in the LAMAS Newsletter Issue 149, January 2017. This talk took us through the night-time, criminal activity along two major roads in South London which linked central London with naval dockyards and the continent. It focused on the last quarter of the eighteenth century, which experienced several notable crime waves, and considered whether the nature of highway robbery on one road was discernibly different from that committed on the other, looking at the impact of key taverns, local turnpikes and nearby convict hulks moored along the river. These all formed part of the local landscape for roadway travellers. Rampant street crime affected different social networks and both formal and informal steps were taken to police these two routes, with mixed results. The talk also considered how different crimes were reported in the newspapers: there were specifics that would help travellers to take precautions. Finally, the talk considered the effect that both routes had on the reputation of their localities (which can still be traced today), and therefore the legacy of eighteenth-century ‘walking’ for present Londoners. Dr Margarette Lincoln is a Visiting Research Fellow at Goldsmiths, University of London, and Curator Emeritus at the National Maritime Museum, Greenwich, London, where she was Deputy Director from 2007 to 2015. Most recently, she edited the catalogue for the Museum’s special exhibition, Samuel Pepys: Plague, Fire, Revolution (2015). She is currently working on a book about eighteenth-century maritime London. Pedestrians in London walked the streets for free, unless they happened to be using a tolled road or bridge. The first half of the 19th century saw the construction of a number of privately financed roads and bridges, many of which – unlike the regular bridges and turnpikes – charged not only carts and carriages, but also pedestrians for the right of passage. These bridges included major central crossings such as Waterloo, Southwark and Lambeth Bridges as well as suburban bridges such as Hammersmith, Battersea, Wandsworth and Deptford Creek. The only road on which a foot toll was charged was Highgate Archway, although Barking Road was interrupted by a toll bridge across the River Lea. This talk described where and why these roads and bridges were constructed, and the growing tension arising from their being built to create communication yet obstructing passage by erecting barriers and charging tolls. It also touched on the adverse social impact that a foot toll might cause, for example hindering poorer citizens wanting to cross the river to enjoy the newly opened Battersea Park, and also depressing the development of new housing in the neighbourhood. There was a growing campaign for the abolition of these tolls which, after many struggles, succeeded in the early 1880s. Simon Morris is a member of the Council of the London Topographical Society and has a particular interest in the development and mapping of London; he is currently researching 19th century street signs. Simon studied law at Cambridge University and History at London University. The winners of this prestigious biennial prize were announced at the London Archaeological Forum on Monday 28th November 2016. There were nine publications on the shortlist. Second was “Roman Sculpture from London and the South-East, CSIR (Corpus Signorum Imperii Romani) Volume 1, Fascicule 10” by Penny Combe, Francis Grew, Kevin Heyward and Martin Henig, published by the British Academy and Oxford University Press. It is available from OUP for £120. (chairman@hadas.org.uk) for £20 plus p&p. The judge’s comment: This is an important book for Hendon and has obviously been the work of many years for the members of the society. It is a great achievement and covers a lot of material which will be of use and interest for many years to come. HADAS has received a cheque for £100 from Dr Ann Saunders MBE to be put towards the cost of our next publication. Ann was president of HADAS from 1998 to 2001 and is a long-time influential member. We thank Ann for her generous donation and wish her well for the future. After an energetic day in Bristol, time to let the feet recover and let motors take the strain. Jo and I first encountered Bradford on Avon when we passed through on a narrowboat on the Kennet and Avon Canal. Our canal map showed a tithe barn next to the canal, so we went to investigate, and then looked round the town. It was on the same trip that we found Claverton, our second point of interest for the day. Time now for a second look. Our coach took us to the far end of the station car park from where a footpath leads along the river bank to the barn. Then from Bradford to Bath. This impressive Grade 1 listed barn was built in the 14th century and was part of the medieval grange belonging to the nuns of Shaftesbury Abbey until its dissolution in 1539, when it then became a private farm until 1974. It forms part of a farm complex and dominates the farm yard. It is of fine cut ashlar masonry, double-skinned with a rubble fill and measuring 51 meters long by 10 wide. The side walls are 0.75m thick, the gable ends are 0.9m and have 4 external buttresses, two corner and two central. Running roughly east-west, the roof is high pitched with stone tiles and projecting eaves. These tiles are hard limestone graded in size, getting smaller as they rise up the roof. Each is drilled and pegged with oak pins hooked over split oak battens. The estimated roof weight is 100 tons. There are 14 bays divided by 13 trusses. Bays 5 and 10 form the porches which are larger on the north side to enable unloading of the wagons. These porches also provide a cross-draught needed for winnowing the corn. The thirteen crucks are individual pairs, each set on a stone foot, all at different heights. This was to make best use of local timber. Two are true single-tier crucks and the other 11 are two-tier crucks. Each truss is made up of about 100 cubic feet of English oak and weighs about 3 tons. There are three tiers of wind-braces. The roof timbers have been dated between 1334 and 1379. Each of the cruck frames has an external buttress built into the wall for added strength. Two of these, at the front west end, have been cut back to allow clearance for a horse engine, a beam pulled by a horse and connected via a shaft and gear to machinery inside the barn (chaff cutter or turnip chopper etc.). The roof was extensively repaired by the Ministry of Works in the 1950s. Whenever I go to Bath, I always imagine myself wearing a poke bonnet and a Regency style gown, in a Jane Austen costume drama. “It is a truth universally acknowledged” that this author wrote mainly about human relationships, ignoring events in the wider world during her lifetime. In fact, in her novels you can find references to naval battles and to the slave trade – but I cannot find any mention of the Kennet and Avon Canal, opened in 1810. Starting at Bathwick, to avoid any locks, we glided along the canal for about three miles. We set off in an elegant, oak-panelled boat, called “The John Rennie” after the canal’s designer, who was responsible for numerous British canals and bridges. A broad beam boat, it only just got through a couple of short tunnels, sometimes bumping the sides. We saw five bridges, one a swing bridge; the first buildings we saw were halfway, at the small village of Bathampton, built of the Bath stone which was quarried locally. After we rounded a bend, the scenery became more hilly. At last we reached the Claverton Pumping Station (to be described separately). This opened in 1813, for the purpose of topping up the canal when it lost water through the locks, or by leakage. On the return journey we enjoyed a cream tea, while observing the various colourful boats, some with comical names such as “My Newt”, or with monkeys as figureheads. After two busy days, it made a nice change to sit and relax on a boat. It also made an interesting change to see a construction that was not by Brunel! We disembarked from our canal boat right onto the canal bank and towpath. Then it was a short walk to reach the little lane that led downhill to cross the railway line – Stop, Look and Listen – and reach the old pumping station alongside a leat off the River Avon. When this part of the K&A Canal was completed in 1810, under brilliant Scottish engineer John Rennie (1761–1821), it was necessary to overcome water supply problems. Fortunately at Claverton there was a convenient site close to the canal and alongside the Avon that had housed a water-powered corn mill. Rennie got his men to rebuild the mill and convert it to a powerful pump house, and it was working by 1813, supplying fresh water to the canal to replace that lost to leakage, evaporation and the operation of locks. We split into small groups, each with a guide, to ease our way through the confined spaces in the 200-yearold building, which is Grade II listed. We admired the huge 24ft-wide wooden breastshot water wheel, over 17ft in diameter. When the sluices are opened, the wheel was designed to permit two tons of water each second to flow onto 48 wooden slats and propel it through one revolution every twelve seconds. Through gears and couplings, this energy translates to drive the vertical con rods powering the engine's two cast-iron rocking beams, each weighing five tons, which in turn drive the 18-inch pistons of the lift pumps. Since 1952 the power to the pumps has been provided by diesel-powered electric motors, which can pump up to 100,000 gallons per hour to top up the canal above. Rennie's machinery had coped continuously until that year when much damage was caused by a floating log which trapped itself in the waterwheel. The problem may have been made worse by a lack of maintenance which until then had been the responsibility of GWR staff based at the Swindon works. Then for fifteen years this lovely gem of industrial archaeology was left abandoned and derelict (by this time the lack of canal traffic meant little need for top-up water). However in the 1960s and 1970s restoration was carried out by students from the University of Bath under the supervision of the Kennet and Avon Canal Trust who replaced and repaired the buildings and equipment and returned the pumping station to a functional state by 1977. From 1978 to 2012 the waterwheel and all other wooden parts and gears were replaced and rebuilt using Douglas fir from Scotland, and we should have seen it all in operation. Unfortunately there had been a few technical problems, but by the time you read this it should all be working well again, thanks to a dedicated band of the Trust's volunteer engineers, some of whom have put in more than thirty years' service. Later the friendly guides showed us their upstairs workshop and mess-room, complete with original cosy Victorian range and hearth – we would have liked to have stayed longer to chat. Our thanks to them all for a most enjoyable and informative visit. “A Festschrift for Tony Rook” is the sub-title, Tony has been involved for many years in the archaeology of Hertfordshire as the Director of Welwyn Archaeological Society and has many publications behind him. This book is based on a conference to mark his 80th birthday in 2012. The first couple of chapters puts the archaeology of Hertfordshire in context together with a potted history of the Welwyn Archaeological Society. Early papers include settlement and landscape from 1500BC - 300BC, much work has been undertaken since 1993. ‘The Baldock Bowl’ a Neolithic and early Bronze-age landscape area to the east of Letchworth is highlighted for its focus and use. ‘When was the Roman Conquest in Hertfordshire?’ The author here (Isobel Thompson) discusses the ‘transition’ of iron-age control to Roman administration. Further papers deal with the survey of Roman coins and hoards through archaeology. Continuing the ‘Romanisation’ theme Simon West (District Archaeologist) looks at recent work on several key sites around St Albans e.g. Folly Lane, Turners Hall Farm: Iron-age settlement to elite (?) Roman villa, Friars Wash Romano-British Temple complex, Six Bells: a bath house and possible mansio inside the walls of Insula XIX. A Saxon hilltop cemetery near Watton-at-Stone is explored and there are a couple of useful chapters covering Hertfordshire fields, hedges, pollards and so forth and the evidence for use of land such as ridge and furrow ploughing techniques. Lastly, the final chapter deals with ‘public engagement’ and community involvement/research in local archaeology under the ‘Dig Where We Stand’ Project. There were several initiatives to train people in different elements such as archaeology, archive research, oral history and digital technology. One of these projects was ‘The Hendon School Community Archaeology Project’ a collaboration between UCL and HADAS. A total of ten evaluation trenches over the years 2006-2012 provided a successful learning experience to students and teachers in a number of disciplines and aims. 20th December. 9.00 pm on BBC4. Digging for Britain. Shown before Christmas. It may be possible to catch up with this on BBC iplayer. The programme features Battle of Barnet archaeologist Sam Wilson. Thursday 26th January. 2.30 pm. NB Earlier time than usual. Finchley Society, Drawing Room, Avenue House, 17 East End Road, N3 3QE. Thomas Reader White. Talk by Mick Crick. Non-members £2.00. Refreshments from 2.00 pm and after the meeting. Tuesday 31st January. 1.00 – 2.00 pm. Society of Antiquaries. From the Dungheap to the Stars: the history of early gunpowder. Talk by Kay Smith FSA. Free but reserve seat in advance. To book online admin@salon.org.uk, or for more information: Tel: 020 7479 7080 https://www.sal.org.uk/publiclectures. Wednesday 1st February. 6.00 pm. Gresham College at Museum of London, 150 London Wall, EC2Y 5HN. Perfection or Pastiche? New buildings in old places. Talk by Dr Simon Thurley on building big in historic cities. Free. Friday 3rd February. 6.00 pm. Geologists’ Association. Geological Society, Burlington House. Piccadilly, W1J 0BE. On the Palaeolithic of Breckland: Old sites, new questions. Henry Stopes Memorial lecture given by Prof. Simon Lewis. Free. Sunday 5th February. 10.30 am. Heath and Hampstead Society. Meet at Burgh House, New End Square, NW3 1LT The History and Topography of the Hampstead Heath Ponds. Walk led by Marc Hutchinson (Society Chair). Lasts approx. 2 hours. Donation £5.00. Wednesday 8th February. 2.30 pm. Mill Hill Historical Society, Trinity Church, The Broadway, NW7. The Work of the War Graves Commission. Talk, speaker to be arranged. Monday 13th February. 3.00 pm. Barnet Museum & Local History Society, Church House, Wood Street, Barnet. From Finchley to the Fatal Shore. Talk by Jackie Leedham. Visitors £2.00. Wednesday 15th February. 7.30 pm. Willesden Local History Society. St.Mary’s Church Hall, Neasden Lane, NW10 2TS. German Spies in the Kilburn Area. Thursday 16th February. 8.00 pm. Historical Association: Hampstead and NW London Branch. Fellowship House, 136a Willifield Way, NW11 6YD (off Finchley Rd, in Temple Fortune) The French Invasion of England, 1216-17. Talk by Sean McGlynn on the invasion involving ‘Bad’ King John & the Barons’ revolt. Friday 17th February, 7.00 pm. COLAS, St. Olave’s Parish Hall, Mark Lane, EC3R 7BB. Recent Excavations at the Curtain Theatre, Shoreditch. Talk by Heather Knight (MoLA) Preceded by A.G.M. Visitors £2.00. Wine and nibbles afterwards. Club, The Manor House, Friern Barnet Lane, N20 ONL. Elstree – Britain’s Hollywood. Talk by Bob Redmond. Visitors £2.00 Refreshments including bar.